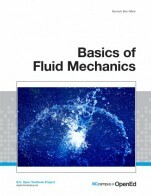 This book, Basics of Fluid Mechanics, describes the fundamentals of fluid mechanics phenomena for engineers and others. This book is designed to replace all introductory textbook(s) or instructor’s notes for the fluid mechanics in undergraduate classes for engineering/science students but also for technical peoples. It is hoped that the book could be used as a reference book for people who have at least some basics knowledge of science areas such as calculus, physics, etc. Basics of Fluid Mechanics by Genick Bar-Meir, Ph. D, Potto Project is licensed under a Creative Commons Attribution-NonCommercial-ShareAlike 4.0 International License, except where otherwise noted. My first comment will be regarding the title: I would not call it basis Fluid mechanics due to possible misleading. Material in the book is theoretically well presented, and it has a good connection with real problems. It empowers students with knowledge to apply for any problem. However students should have great background in Basic fluid mechanics as well as in Mathematics.